One of the largest cities in Telangana, Nizamabad is also referred to as the city of Nizams on account of its history related to the Nizams of Hyderabad. Even though it is said to have been established during the rule of the Nizams in the early 20th century, it is still believed to have been founded several centuries ago in the Medieval Period of India. Today, Nizamabad is popular for its ancient sites and historical monuments and is also frequented by several weekend travellers and picnickers on account of the presence of numerous natural sites in and around the region. As it is one of the few places in India where you can learn in detail about the history of the Nizams, it makes for a perfect destination for travellers, especially history lovers. If you are one amongst such travellers, then read on to know more about Nizamabad, its tourist attractions and how to reach it from Hyderabad. The region in and around Nizamabad experiences extremely hot summers, and hence it is not a preferred destination for tourists coming from other cities and towns. The best time to visit is from October until the end of February as during this period, the temperature conditions are favourable and the weather is pleasant. By Air: The nearest airport to Nizamabad is situated in Hyderabad. By Rail: Nizamabad has a commendable rail connectivity and is well connected to Hyderabad and other major cities. You can catch a direct train from Hyderabad to Nizamabad. The entire journey will take an approximate time of 3 h.
By Road: Being one of the significant towns in Telangana, Nizamabad is easily accessible by road. You can either take a direct bus or hire a taxi from Hyderabad to reach it. On your way, you can also take a break at Kamareddy and witness its beauty present in the form of rich culture and traditions. Kamareddy is located at a distance of about 117 km from Hyderabad and 55 km from Nizamabad and is a destination for those who love exploring offbeat. Even though there are not many places to savour within its boundaries, it will certainly interest you on account of its age-old culture, beautiful temples and rich traditions. Kamareddy is popular amongst locals for its textile centres. The region is surrounded by beautiful farm fields, and hence you can experience the beauty of a country life here. Most Read: Do You Know About These Hidden Destinations In Telangana? Nizamabad is located at a distance of around 175 km from Hyderabad and is an ideal stoppage for offbeat travellers who always look forward to the unknown history of any place. But do you know Nizamabad has in store a lot of natural places too? Yes, from lakes to forests, it has numerous weekend getaways where you can enjoy the serenity of nature. Following is the list of the must-visit places in Nizamabad. There cannot be a better place than Nizamabad Fort to start your journey of exploring the rich history of Nizamabad. It is one of the oldest forts in the state and was built in the 10th century during the reign of the Rashtrakuta dynasty. However, it was ruled by several dynasties, such as the Kakatiyas and the Khalji dynasty, later on. It was the Nizams of Hyderabad who renovated the fort and turned it into a marvellous monument. Therefore, it is a perfect place to learn about the history of the Nizams. Even though the fort is lying in ruins, it certainly deserves to be explored on account of its centuries-old history. Looking for a place in Nizamabad where you can just sit and relax and enjoy a serene and peaceful environment? 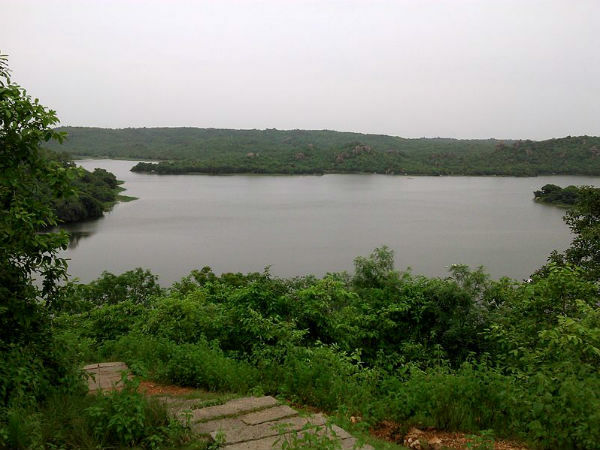 If yes, then you must plan a tour of Alisagar Reservoir which is located on the outskirts of the city. The region is surrounded by lush green vegetation, and hence it makes for an ideal picnic spot for the locals as well as tourists. If you are looking forward to exploring the rich flora and fauna of Nizamabad, then Mallaram Forest is a perfect place where you should be this weekend. Blessed with thick vegetation and beautiful waterbodies, this richly diverse forest is all you need to soothe your nerves. Over a period of time, it has also gained popularity as an eco-tourism destination. Badapahad is a beautiful mosque at a distance of about 38 km from Nizamabad and is a site of great religious importance amongst Muslims. It is located atop a rocky hill and is built in the loving memory of saint Hazrat Syed Sadullah Hussain. You must visit this beautiful site if you would love to get lost in a divine aura. Other tourist attractions in and around Nizamabad which might interest you include Pochampad Dam, Nizam Sagar, Kanteshwar Temple, Nizamabad Museum and Lord Shiva Temple.